‘Nouvelle Chinoiserie’ 奇趣漢學 Qíqù hànxúe draws inspiration from the name of a ruined pavilion at the Qing-dynasty Garden of Perfect Brightness — Yuanming Yuan 圓明園 — to the northwest of Beijing. The Western Palaces 西洋樓, or follies, were designed for the Garden by Jesuit court missionaries during the eighteenth-century Qianlong reign. They combined the Rococo of Europe with Manchu-Chinese architectural elements (and imagination). 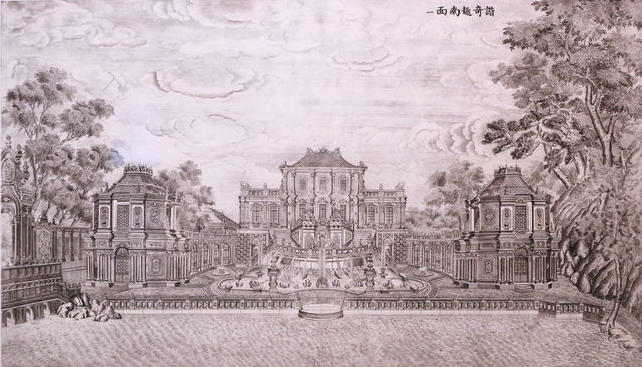 One of the main palaces created by the Jesuits was called ‘The Strange in Harmony with the Delightful’ 諧奇趣. Qíqù 奇趣 — the strange married to the delightful — seems to convey best the essence of ‘Nouvelle Chinoiserie’ as conceived by John Minford. This is a term I enjoy using to describe my own slightly heretical take on the New Sinology. The two differ in significant ways: the one seeming to be more political and engaged with contemporary reality, the other more frivolous and concerned with the delights of the past. But they have much in common. They interact. Sometimes the absurd antics of today’s Central Committee read like extracts from the fifth-century New Tales of the World 世說新語; while some of Pu Songling’s merciless eighteenth-century Strange Tales 聊齋志異 read like Lee Yee’s 李怡 biting articles in Apple Daily 蘋果日報. Our Wairarapa Academy’s recent Longwood Symposium, Dreaming of the Manchus 八旗夢影 (February 2018), took its inspiration from the idealism and aestheticism of the Seven Sages of the Bamboo Grove 竹林七賢 and the Gathering at the Orchid Pavilion 蘭亭集. But the dark shadows of political repression, past and present, were never far away (the persecution by the Yongzheng Emperor of the family of Cao Xueqin 曹雪芹, the Sima Clan’s destruction of the great Taoist blacksmith-musician Xi Kang 嵇康). The most accomplished poet of the Seven Sages coterie, Ruan Ji 阮籍, with his famous cycle, ‘Songs of my Heart’ 詠懷詩, was a famous instance of the intricate and ambiguous relationship between lyricism and politics. It was no accident that Cao Xueqin took as one of his literary names ‘Dreaming of Ruan’ 夢阮. Wairarapa Readings celebrate the variety and vibrancy of China’s literary heritage. They introduce literary texts and translations aimed at students of traditional Chinese letters who are interested in the rich cultural world that lies beyond the narrow confines and demands of contemporary institutional pedagogy. 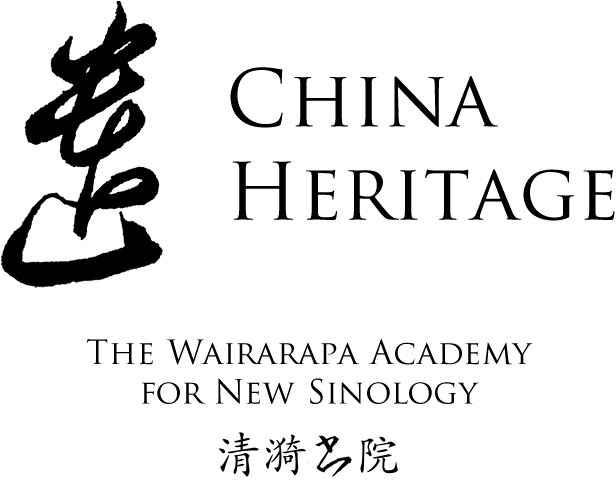 They also reflect the long-term interest of The Wairarapa Academy for New Sinology in ‘cultivation’ 修養. As part of our recently completed Wairarapa Academy Symposium ‘Dreaming of the Manchus’ 八旗夢影, which took place at Longwood Estate near Featherston in late February this year, we held a number of informal Translation Salons 竹林譯苑. For these we prepared and distributed a series of Wairarapa Readings 白水札記. The first Wairarapa Reading published by China Heritage featured two letters addressed to Jia Bao-yu 賈寶玉 in Chapter 37 of The Story of the Stone 紅樓夢 translated by David Hawkes. ‘Occupied with Idleness’, the second Wairarapa Reading in China Heritage, continues our meditation on the theme of Idleness by introducing works by Bo Yuchan 白玉蟾 of the Song dynasty, Li Mi’an 李密庵 of the Ming and Jin Shengtan 金聖嘆 of the Qing. They are all translated by Lin Yutang 林語堂 in The Importance of Living (1937). The Bamboo Grove was located in Shanyin 山陰 county, Henan province 河南 (to the northwest of modern day Hui county 輝縣). In the fourth century of our era, or the Wei-Jin 魏晉 period in China, it is said to have attracted a group of what would now be called bon vivants and wits. They were nonconformists who chaffed at the restraints of court Confucianism and the expectations of a society defined by rigid hierarchy, empty ritual and slavish compliance. Many of their bons mots as well as those of their motley fellows are collected in New Sayings of the World 世說新語, a work compiled by Liu Yiqing 劉義慶 (403-444CE). Here we commemorate the Seven Sages of the Bamboo Grove 竹林七賢 by creating our own Bamboo Grove to reflect the spirit of Warriors of Light, people who through literature, art and translation champion the untrammelled spirit. In the Bamboo Grove of China Heritage we will, over time, collect material related to the tradition of the Seven Sages and their influence on art and letters. Yuan’s…position was that literature has domains of its own and need not necessarily be a vehicle for moral edification, that it need not be written in close imitation of some approved ancient period or individual great master, and that it cannot become ‘great’ by borrowing phrases and even whole lines from the great writers of the past. Literature and especially poetry, Yuan Mei maintained, is above all an expression of individual temperament and feeling and, within the general framework of traditional technique, that temperament must find its own phrasing, its own idiom. — Yuan Mei: Eighteenth Century Chinese Poet, 1956, p.167. The Seven Sages of the Bamboo Grove (I). Impressed clay brick from a tomb in Nanking. The Seven Sages of the Bamboo Grove (II). Impressed clay brick from a tomb in Nanking.